Read it to understand what’s really at stake in abortion and to learn how to care for all those involved. And please tell others to download this free resource! A compelling manifesto by the bestselling author of Heaven, “Why Pro-Life?” offers factual answers to the central issues of the abortion debate in a concise, non-abrasive way. Infused with grace and compassion, and grounded in medical science and psychological studies, Randy Alcorn presents a solid case for defending both unborn children and their mothers. 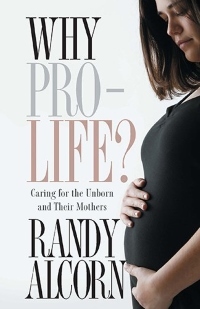 Chapters such as, “What Makes a Human Life ‘Meaningful, ‘” “Is Abortion Really a Women’s Rights Issue,” and “How Can I Help Unborn Babies and Their Mothers” help readers to look at the many sides of this polarizing issue. For those on the fence in the midst of the abortion debate, this book will be a great resource as it clearly and thoroughly examines the pro-life position. For those who are pro-life already, this book is an encouragement to be intelligently and graciously informed. Talking about abortion can be hard, but “Why Pro Life?” makes it a lot easier! Get started on being “intelligently and graciously informed” today by downloading a free copy of the entire book, compliments of Randy Alcorn and Care Net.